BBOC pin sets were available for BBOC members to order from September 16 - December 16, 2002. Each 5-pin set (packaged in a red, plastic box) included a Ty logo pin, a BBOC pin, a Clubby pin, a Patriot pin with the USA flag on its right or left foot, and a mystery "Original 9" Beanie Baby pin. 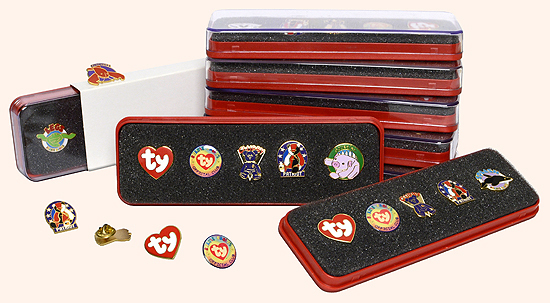 When members placed an order, they did not know which Original 9 Beanie Baby pin would be included in their set(s). The price of the pins (including shipping) was $15.40 for one set or $25.75 for two sets. The pins showing Chocolate and Cubbie do hot have the names of the Beanie Babies on the pin. 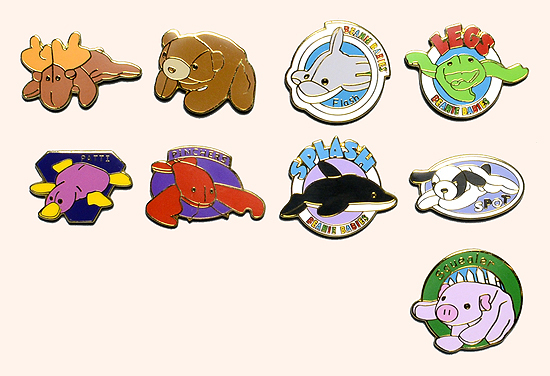 The other seven pins all show the name of that pin's Beanie Baby.